The green movement isn’t new. It’s been the focus of many sustainable-minded people for decades, and has become increasingly important for many industries in recent years, especially those that directly impact consumer health and the environment. One such industry is dry cleaning, where the chemicals used in the cleaning process, along with the packaging used, plays a large role in how eco-friendly a business is operating. Dry cleaning customers are becoming more educated on these issues, and forward-thinking dry cleaning business owners are already making changes to meet consumer demand. Whether starting by switching chemicals to avoid using perc, updating cleaning processes and machinery, or focusing on creating less pollution of the water and air supply, dry cleaners that are making green changes are meeting the customer desire and demand to take their business to companies they can trust, like and respect. For dry cleaning businesses that have not yet taken the leap into becoming more green, now is a great time to start. 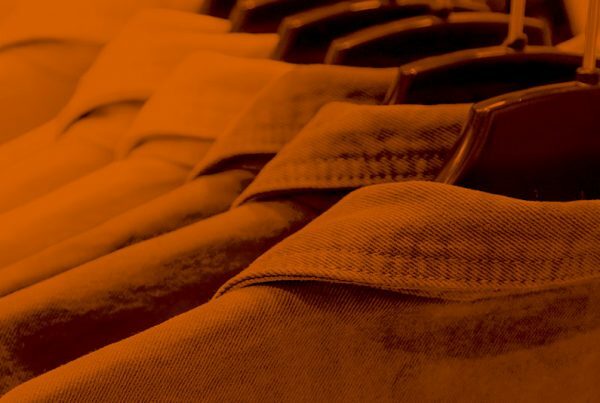 In additional to upcoming legislation that will create new guidelines for dry cleaning chemical use in certain states, dry cleaners that take the leap into sustainability will have a leg up on the competition. They may also be able to avoid the risks of losing customers that care about green topics, as well avoid imposing negative health and environmental issues on the community. Unfortunately, there is also the potential to lose business to other companies that may be claiming to be green and marketing that (whether or not they are!) This is why it is important to actually invest in the green changes a business is claiming to make and to understand how marketing those changes can be effective in the long run. For a dry cleaner, the storefront is the perfect place to showcase a commitment to going green. From branded signage to eco-friendly packaging displays, the storefront really is a place to go all out in giving customers a glimpse into the store’s sustainability efforts. One easy way to accomplish this is by printing up branded and detailed collateral that effectively explains the green focus areas of the company. This easy-to-digest material can be a great way to educate customers while they are in line or waiting to pick up their garments. As the saying goes, content is king these days. Sharing a unique perspective on what it means to be a green dry cleaner can not only position a business as a thought leader in the space, but it can also serve an important role in driving more customers to the business’ website. That’s because well-written, educational content can help improve a website’s search engine optimization, or SEO, and can ensure a business ranks higher when it comes to customers’ Google searches. Content can come in many forms, but launching a blog can be an easy and measurable place to start. Once a business has content, it is helpful to get it out to more people via social media sharing. There are many social channels to choose from, but creating a presence on Twitter and Facebook can be a great place to begin reaching consumers that are interested in learning more about green dry cleaning options. Content can be created or re-shared on these channels, and gives business owners a direct communication channel with their customers in real time. Green certification is a great option for businesses in all phases of the going green journey. From those businesses that are just starting out to ones that have already made considerable strides in their green business practices, green certification can offer a way to visibly showcase to customers a commitment to making eco-friendly changes, as well as can provide steps to making even more updates in the future. To learn more about this opportunity, and the additional benefits green certification can offer, check out the Green Business Bureau “Why Join” page. In addition to supporting the health of the community and the environment, making green changes to a dry cleaning business’ operations can attract and keep customers, and even retain employees. But, making changes isn’t enough. Marketing them effectively is important to securing more customers who care about sustainability. It is also important to be aware of the delicate balance between informing and creating hype – marketing done right will effectively communicate a business’ offerings, while also instilling long-term trust in its customers.